31.3.2017@Orpheum Extra: Presentation of the book Jazz & the City: Jazz in Graz von 1965 – 2015 (Leykam 2016) and the CD Jazz & the City (and me…) (Alessa Records 2016) as part of the 200th anniversary of the University of Music and Performing Arts in Graz. 11.5.2017@Aula der KUG (provisional): Stage Band (directed by Sigi Feigl) plays the music of the jazz orchestra of the jazz institute in Graz (1960s/1970s bandbook) with special guests. with compositions by Erich Kleinschuster, Friedrich Waidacher, Harry Pepl, Michael Kahr and references to the artistic work of Dieter Glawischnig, Harald Neuwirth, Karlheinz Miklin and other veterans of the jazz scene in Graz. Performances by Martin Harms (as, ts, bs, fl, cl), David Jarh (tp, flh), Michael Kahr (p, comp), Wolfram Derschmidt (b), Jörg Mikula (dr) and Frank Hoffmann (voice). 10. December 2016: New CD available through the website of Alessa Records (http://www.alessarecords.at/jazz-art) with Martin Harms, David Jarh, Mario Vavti, Wolfram Derschmidt, Jörg Mikula und Frank Hoffmann! 17. November 2016: Presentation of the new CD “Jazz & the City (…and me)” on Alessa Records ALR 1047 with a concert at Jägermayrhof in Linz. 12. November 2016: Premiere of my composition for 8 musicians and a painter, commissioned by Hapé Schreiberhuber and the Styraburg Festvials in Steyr. 26. – 28. September 2013: 11. Jazz Research Congress of the Institute for Jazz Research and the International Association for Jazz Research in Cooperation with the Jazzinstitut Darmstadt in Darmstadt chaired by Franz Kerschbaumer and Wolfram Knauer. Michael Kahr’s paper “Herbie Hancock, Chromatic Harmony and Clare Fischer” and Participation in the Panel Discussion “…Who Owns Jazz?” on September 28. 9. and 14. 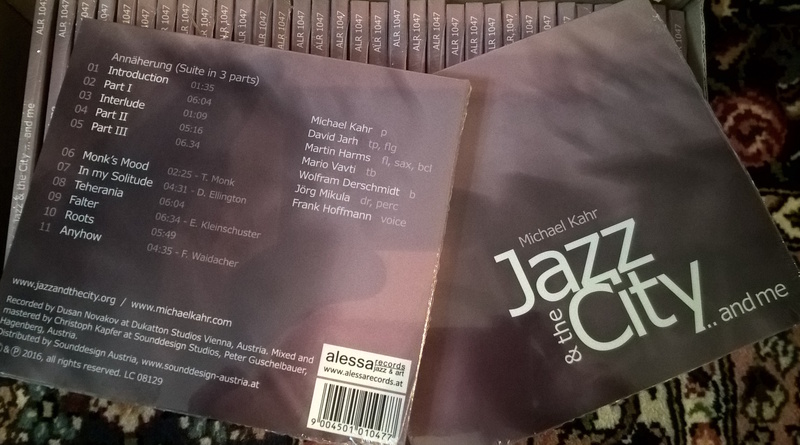 August 2013: Michael Kahr’s performances with Manfred Josel, one of the modern jazz pioneers in Graz, and Richard Oesterreicher, the former leader of the Popular Music Orchestra of the Austrian Broadcasting Company ORF in Graz (Royal Garden Jazz Club) and Gleisdorf. September 21, 2011: Lecture @ Jazz Research Round Table at Rutgers University, Newark, N.Y.